We Can Sell and Service the Xerox Colorqube 8900 Anywhere in the USA. Call us for a quote! The XEROX 8900 is a new breed of copier. The 8900 is the first multi-function printer/copier equipped with a solid ink device. A truly smart printer, the XEROX Colorqube 8900 comes lets users modify color using a natural language interface. Users have their choice from a 50,000 color palette and documents, once adjusted, can be printed with 2400 Fine Point resolution. Much like the sci-fi photo enhancement machine featured in the movie Blade Runner (starring Harrison Ford) a few decades ago, the XEROX 8900 is a unique technological advancement by XEROX. Built for small and medium businesses, the XEROX 8900 is perfect for those who want to do low cost color copying. A multi-function machine, the 8900 comes complete with the ability connect to the web via Ethernet or a wireless connection. The Colorqube 8900 supports email, scanning, and faxing of documents. The XEROX 8900 can carry a heavy load with a duty cycle of up to 120,000 copies and recommended monthly income of 15,000 copies per month. 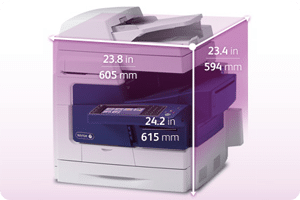 The XEROX 8900 has duel side copying and the ability to crank out 44 copies per minute. An optional finisher allows customers to staple packets of up to 15 pages together. Like all XEROX machines, supplies for the XEROX Colorqube 8900 can be ordered through the web-based e-Concierge system. With e-Concierge supplies are ordered before they run out reducing downtime. For more information about how you can buy a XEROX 8900 contact us today. Find out what a XEROX Colorqube 8900 can do for your office.